Pacific Nuclear Transport Ltd (PNTL), International Nuclear Services (INS) and Sellafield Ltd are today commencing the latest return of highly active waste from the UK to Japan. This is the sixth such shipment from the UK demonstrating excellent progress in the programme to return foreign-owned waste stored in the UK to its country of origin. Overall it is the eighteenth shipment of its type from Europe to Japan since 1995. 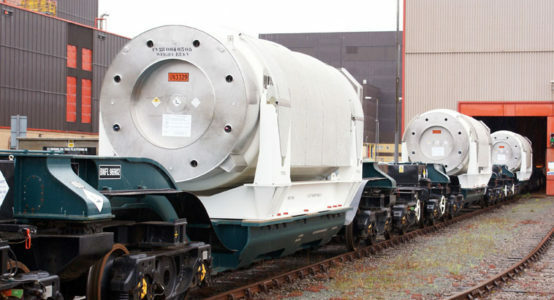 Five transport flasks containing a total of 132 canisters will be transported by rail from Sellafield to Barrow-in-Furness. They will be loaded on to the Pacific Grebe, a purpose-built nuclear cargo vessel, after which they will be shipped to Japan. The route to Japan will be released several weeks after the vessel departs the UK but, as always, the vessel does not plan to stop at any country on the way. The programme is called the Vitrified Residue Returns, a key component of the Nuclear Decommissioning Authority’s strategy to clean up the Sellafield site, fulfil contracts with overseas customers and deliver UK government policy. Vitrified residue describes the physical form of the highly active waste. It is a solution of radioactive waste and molten glass that is mixed in a stainless steel canister and allowed to cool to form an impermeable, immobile and insoluble glass block. It is an ideal form for transporting and up to 28 of these canisters are put into a 120 tonne extremely robust transport flask, 90 percent of which by weight is devoted to radiation shielding to make it safe to transport. All transport safety and security arrangements comply with national and international regulations and guidelines.